Sustainable buildings present unique challenges in acoustic design including considerations as to the materials allowed, low internal noise level, energy efficiency and emissions. However, the opportunity exists to satisfy these challenges with Soundmask's systems. In green buildings, the noise of a traditional HVAC (heating, ventilation and air conditioning) unit is replaced by the quiet of natural ventilation and radiant cooling. Intrusive noise and a lack of speech privacy is suddenly a bigger problem because of the low internal noise level. These issues are addressed by adding a wash of non-intrusive background sound via a sound masking system. Soundmask uses a unique randomised gaussian noise to ensure user comfort. Another issue in a sustainable building is the elimination of fibreglass or other unsustainable ceiling tiles. These tiles are then replaced with a lower weight synthetic tile or no tiles at all. In such situations, the tiles no longer absorb sound. Further, diffusing sound becomes a problem for some sound masking products where the soffit is covered with non-reflective thermal panels. Soundmask has developed an acoustic disc (pictured) which gives an excellent spread of sound and can in fact increase the speaker grid. Soundmask’s systems become no less diffusive and can be installed above layers of plaster board with equal results. In order to achieve green star, sustainability or LEED ratings, the energy efficiency of a sustainable building becomes important. Soundmask systems are so energy efficient that running a whole building takes less energy than an average Desktop Computer. 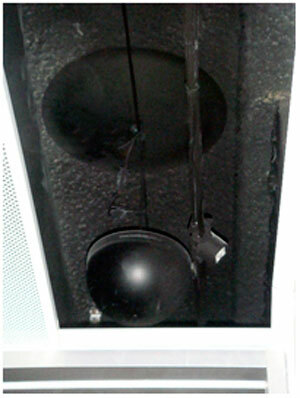 In fact energy costs from a Soundmask system are typically as little as $25.00 per annum for an entire office. Using a Soundmask system in acoustic design satisfies considerations of efficacy and sustainability. Soundmask’s systems comply with RoHS standards and use halogen-free wiring. Having met the challenge with installations in various green star rated buildings (including 6 green star and LEED rated buildings), Soundmask’s systems are tried and tested for your sustainable building. Click here to read a paper by Bassett Acoustics' Danny Boglev about acoustics in sustainable buildings. 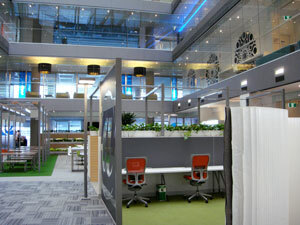 AMP Financial Services’ 6 Green star rated Docklands office where a Soundmask system was used to create a layer of non-intrusive background sound. Soundmask transducer with acoustic disc installed in the acoustically transparent ceiling with pressed metal drop in tiles with a punched pattern. The soffit is covered with polyester thermal panels.